Krispy Kreme has a fundraising tradition of more than 50 years which has brought success to a lot of schools, clubs and other non-profit organizations. Americans are crazy about doughnuts and that makes the Krispy Kreme fundraiser a perfect way to raise some money for charity or other goals. You may think that a donut is as simple as it sounds, but Krispy Kreme has come up with some creative combinations of tastes and flavors, which helps them win clients with every fundraising occasion. Moreover, with Krispy Kreme you can get profit by selling the doughnuts, but also cards and partnership certificates. You could even do all three fundraisers at the same time. Why do so many people prefer Krispy Kreme fundraising? Products are made fresh and packaged by the dozen in special fund-raising boxes. 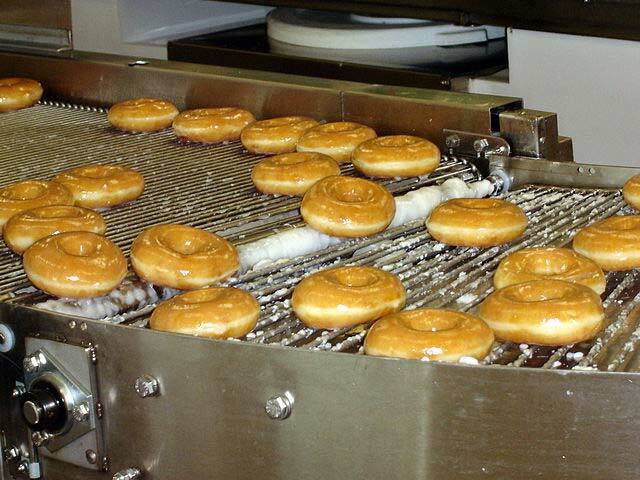 Krispy Kreme donuts rolling off the assembly line. Traditional Doughnut Sales. You simply buy the doughnuts at a reduced price and then re-sell them for full retail price or higher. Be creative about the location and time of distribution: you can choose to sell them at lunch time at high traffic areas, in the shops, intersections, community festivals, or to pre-sell them to family, friends and neighbors. Certificates are an alternative to selling actual doughnuts. Your supporters can redeem each certificate for one dozen doughnuts at any participating Krispy Kreme retail store. Partnership Cards. By buying a Partnership Card, your supporters will get a free dozen doughnuts by purchasing a dozen of their choice. Their card gets punched each time they use it and they can use it up to ten times. After you take the order, select the coldest location available (out of direct sunlight and heat) as the point of distribution. Watch out for hidden costs such as shipping and prizes as they may affect your profit.